Imagine recovering from illness while lying in a dark, study room, with no sunlight or fresh air. Or what if you had a lung disease, and the most widely accepted treatment involved inhaling smoke? These may seem like outrageous medical practices today, yet they were common treatments more than 150 years ago. Back then, health tonics were often made from substances that are now considered harmful or illegal, and treatments for a variety of common conditions involved painful procedures that would be deemed inhumane by today’s standards. 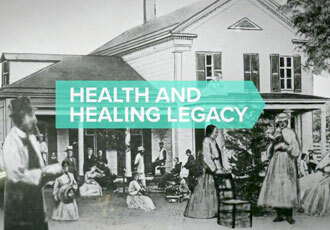 In 1866, a small group of Seventh-day Adventist believers opened the Western Health Reform Institute in Battle Creek, Michigan (later known as the Battle Creek Sanitarium), and they began pioneering health practices that altered society’s fundamental understanding of medicine and healthy living. In sharp contrast to the seemingly barbaric medical practices of the day, they taught new principles like sunshine, daily physical exercise, a nutritious diet, rest, good hygiene, and fresh air. These were just a few of the many innovations that helped communities avoid illness and live healthier lives. As members of the newly formed Seventh-day Adventist Church, the health care pioneers believed God had called them to follow the example of Jesus Christ. They dedicated themselves to continuing Christ’s ministry of healing the physical, emotional, and spiritual needs of others, while pursuing innovative ways to make health care safer and more e ective. Their approach to caring for the whole person, and not just treating illness, was revolutionary back in 1866. The Battle Creek Sanitarium attracted thousands of patients over the years including such notables as Henry Ford, Thomas Edison, Dale Carnegie, and Amelia Earhart. Under the guidance of medical director John Harvey Kellogg, patients received innovative care for illness and injury while, through cooking and exercise classes, and lectures on health and temperance, also learning about healthy living. Kellogg was an advocate of a plant-based diet and, along with his brother, would later become known for the invention of Kellogg’s Corn Flakes. The Sanitarium would be the rst of many health care facilities built by the Seventh-day Adventist Church, and thus herald the beginning of an Adventist legacy of Christ-centered, compassionate, whole-person health care. Since the beginning, the philosophy of Adventist health care has never been for the status quo; instead we rigorously strive to be better than we were yesterday and to evolve in unexpected ways. This legacy of innovation continues today—more than 150 years later—and we celebrate this milestone. Our emphasis on treating the whole person has become the foundation for today’s health care industry practices, and lifestyle studies worldwide recognize that this approach plays a critical role in longevity. The health principles found in the Bible’s creation story—Choice, Rest, Environment, Activity, Trust in God, Interpersonal Relationships, Outlook, and Nutrition— provide a lifestyle blueprint that works naturally to improve one’s health, reduce risk of disease, and help people discover more enjoyment in life. This CREATION Health wellness philosophy is the foundation for tending to the physical, emotional, and spiritual needs of each person in our care. Content on this page used by permission of Adventist Health System.